Twice baked potatoes are better than once! Try this baked potato recipe and pair them with a juicy steak or burger! 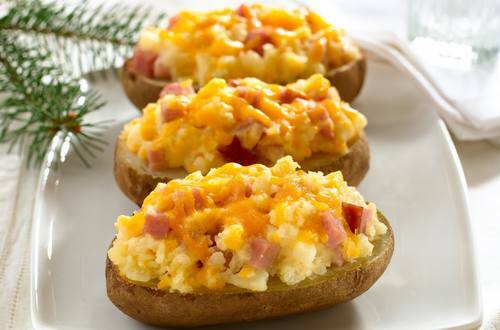 Top them with ham for a fun twist. They're so cheesy you won't be able to resist. 2 Cut potatoes in 1/2 lengthwise. Scoop pulp from potatoes, leaving 1/2-inch shells; set aside. 3 Mash pulp with 1-1/2 cups cheese, Hellmann's® or Best Foods® Real Mayonnaise, sour cream and ham. Evenly fill potato shells with potato mixture. 4 Arrange potatoes on baking sheet. Top with remaining 1/2 cup cheese. Bake 25 minutes or until cheese is melted and potatoes are heated through. TIP: To make kid-friendly Potato Boats, cut bell peppers into circles with 2-inch cookie cutters, making holes in the center with the wide end of a pastry tip to make innertubes. Cut triangles from peppers to make sails, using toothpicks to rig the sails and inner tubes.